Check out the new 1891, 1900 and 1910 Norway census records at MyHeritage (announcement below) and then watch one of our webinars on Nordic research to learn how to find your Norwegian ancestor. We’re happy to announce the addition of three important census record collections from Norway, from 1891, 1900, and 1910, to MyHeritage SuperSearch™. Added in collaboration with the National Archives of Norway (Arkivverket), these 6.8 million new records are rich in family history information. The collections provide robust coverage for Norway’s entire population during a span of two important decades in Norwegian history. Two of the collections include digital images of the original historical records. This is the first time that Norwegian collections of such high quality are available. With the release of these new collections, MyHeritage now offers approximately 34 million historical records from Norway, including census, baptism, marriage, and burial records. As the Scandinavian market leader for family history research and DNA testing, MyHeritage also offers 136 million records from neighboring Sweden and 105 million records from Denmark. MyHeritage is the only major genealogy company to provide its services and full customer support in all three Scandinavian languages, as well as in Finnish, and offers the greatest potential for new family history discoveries for anyone with Scandinavian origins. It also has the largest user base in Scandinavia and the largest collection of Scandinavian family trees. With the exception of Ireland, no other country saw a larger percentage of its population emigrate to the United States than Norway. Search these new Norwegian collections to learn more about your ancestors’ lives, and enhance your family tree with fascinating family history discoveries. Adopted? or know someone who is and is looking for their biological family? DNA Quest is a new pro bono initiative to help adoptees and their birth families reunite through genetic testing. The initiative, initially launched in the USA only, received an amazing response. More than 10,000 applications have been submitted so far to receive free DNA kits, from the quota of 15,000 free DNA kits pledged by MyHeritage, worth more than one million dollars. Being that the deadline for submissions is the end of April 2018 and there are still about 3 more weeks to go, and in light of the many requests we received from the community to expand DNA Quest worldwide, we decided to increase the scope of the project, as of today, from USA-only to global. This means that people are now eligible to participate in DNA Quest regardless of their place of residence and regardless of where the adoption took place. DNA Quest is brought to you by MyHeritage, in collaboration with a top-notch advisory board, which includes top experts in the fields of genetic genealogy and adoption. Information about the DNA Quest initiative including a detailed FAQ and an application form are available on the project website, https://www.dnaquest.org/. Participation in DNA Quest is open to adoptees seeking to find their biological family members, or anyone looking for a family member placed for adoption. Preference will be given to those unable to afford genetic testing, and to those who apply first. Adoptees and family members searching for their biological relatives can apply for a free MyHeritage DNA kit at DNAQuest.org through April 30, 2018. Participants will be selected, and their free DNA kits will be shipped to them by the end of May 2018. Results are expected as early as July 2018. If you have already taken a DNA test with another company, you are invited to upload your DNA data to MyHeritage for free and participate in this initiative as well. We are very excited to expand DNA Quest globally, in order to help families reunite through the power of genetic genealogy. We look forward to the life-changing reunions that will surely take place as a result of DNA Quest. Please help us spread the word on social media, especially with the news about DNA Quest going global, and include a link to the www.dnaquest.org website to make this dream a reality for families around the world. MyHeritage, the leading international family history and DNA company, announced today the addition of the Ellis Island and Other New York Passenger Lists 1820-1957 collection to SuperSearch™, the company’s global search engine containing more than 8.25 billion historical records. The records are of major significance for anyone looking to trace their immigrant ancestors’ arrival in America, and include names, dates, countries of origin, addresses of family members and friends, occupations, and physical descriptions, among many other details. The passenger manifests are an unparalleled source of information spanning key years of immigration from all over the world, including those entering the United States as refugees during the First and Second World Wars. The records include millions of entries via Ellis Island, which opened its doors on January 1, 1892. The first 72 years of the collection pre-date Ellis Island; Prior to the establishment of Ellis Island, the primary immigration station in New York City was Castle Garden, which opened in 1855, and before then, immigrants were received at several piers across the city. Towards the end of the timeframe, in the 1940s and 1950s, advancements in transportation methods are noticeable as records begin to include those who arrived via airplane to various airports in and around the city. The plethora of information in the records is expected to invigorate family histories, adding previously unknown stories of how family members uprooted their lives, and replanted them in the United States. As of 1897, immigration officials began asking those entering the United States for the name and address of the relative or friend whom they are joining in the USA, and in 1907 they began asking for the name and address of their closest relative or friend in their home country. The responses to these supplemental questions, that have been filled in the passenger manifests, have now been indexed by MyHeritage for the very first time, yielding an additional 26.6 million names in the Ellis Island and Other New York Passenger Lists collection on MyHeritage. These passenger manifests have been digitized by other organizations in the past, but the answers to these vital supplemental questions have never been indexed — until now. Furthermore, many of the passenger manifests span two pages, and a common omission for genealogists has been to locate the first page and miss the existence of the second. MyHeritage has solved this problem for the first time by stitching the double pages into single document images, ensuring that users do not miss information again. Many historical figures of interest are found among these records, including Albert Einstein (who arrived in the US on October 17, 1933), former U.S. Secretary of State Madeline Albright (arrived November 11, 1948) and Charlie Chaplin (arrived October 1912). Composer and songwriter Irving Berlin who moved to the U.S. in 1903, appears on several manifests arriving from different places in Europe. Users with family trees on MyHeritage will immediately benefit from Record Matching technology that automatically reveals new information about their ancestors who appear in these records. MyHeritage is working to add additional immigration records into the collection from other port cities from around the United States, as well as several important Canadian border crossings, in the near future. Searching the Ellis Island and Other New York Passenger Lists collection is free. A subscription is required to view records and scanned images and to access Record Matches. Given this past week’s events in Texas related to Hurricane Harvey, and as the storm makes its way through the American South this weekend, it is easy to feel helpless if you and your family are not directly impacted. In speaking with genealogy friends and colleagues, I don’t think there is any degree of separation from this disaster: we likely all know at least one person who has lost their home, their business and their possessions. Besides contributing to various charities, gathering relief supplies and volunteering, here is something you can do for yourself: put together a disaster plan related to your genealogy and family history research. Melissa Barker, aka The Archive Lady, knows all too well what can happen to important papers and artifacts as well as data when a disaster hits. Whether it is fire, flood or simply a computer failure, Melissa has created a guide at Legacy Family Tree entitled Disaster Planning for the Genealogist. 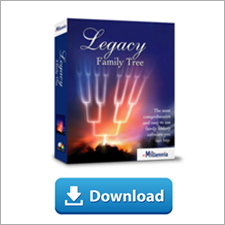 Through a special arrangement with our friends at Legacy Family Tree, Melissa wants to make sure that every genealogist has access to this important information. That is why Disaster Planning for the Genealogist is available as a FREE DOWNLOAD starting Thursday, August 31st through Sunday, September 3rd, 2017. Click HERE to get your PDF copy now! Please take a minute not to just download the guide, but please read it and seriously consider what would happen if you lost treasured family heirlooms or research data related to your genealogy. You can at least minimize damage from various disasters, if not prevent such damage all together. So this weekend as you keep others in Texas in your thoughts and prayers, take a minute to do your homework and put together a disaster plan for your genealogy. I normally don't mind who gets credit, but when there's a billion free records on the line, I don't mind giving myself a little public pat on the back. For the first time ever, MyHeritage is opening their entire collection of census records - 94 different databases containing more than 1 billion records, many of which are only available at MyHeritage - for free for a week - as part of their 8 billion historical records milestone celebration. In the brief time we've been under new ownership, I've passed along many of your suggestions to MyHeritage management, including one of my own - "why don't we show off your census records for free for a time?" I knew they had lots of records that weren't available anywhere else, and this might be a nice way to introduce these exclusive databases to the public. Well...they listened, and between now and August 20, anyone can search these databases without the usually-required Data subscription. You all know that much of our Legacy software's success comes as a direct result of your suggestions. It looks like MyHeritage is anxious to continue this tradition. Of course, time will tell, but this is a great start! Which records are free on MyHeritage? Click on the links above to search the records, or click here to read their full announcement. Michele Simmons Lewis receives Certified Genealogist credential from BCG! Congratulations to our very own Michele Simmons Lewis, CG who was notified today that she received the Certified Genealogist credential from the Board for Certification of Genealogists. Michele is one of our senior technical support staff members and is the face of our Legacy User Group on Facebook. Becoming certified is a really big deal and we are so proud of her! We continue to support genealogy standards by hosting the webinar series for the Board for Certification of Genealogists, held the third Tuesday evening of each month. 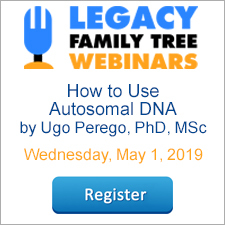 Visit www.familytreewebinars.com/BCG to register for their upcoming webinars and to view the classes in their library. And who knows, maybe we'll see Michele's picture appear on this page soon. We received a fun mention in the February 2017 edition of Kiplinger's Personal Finance! On slide 6 of its article, "14 Great Ways to Spend or Invest $1,000" Kiplinger recommends learning to trace your ancestry. Their very first recommendation - start with Legacy Family Tree Webinars! How great is that!! Check out the article here. Where does Newspaper Research fit into YOUR Genealogy? "I never felt so lonesome in my life and I never worked so hard in my life, but I never was so happy in my life." "The money comes in so fast we actually don't know what to do with it. We had gold money, paper money, silver money and gold dust hidden in every nook and corner of the house. Loren tore up a plank from the kitchen floor, and we had over $5,000 in all kinds of money hidden there. It was an awful anxiety to have the stuff lying around like that, and it worried us more than the hard work we were doing. The place was full of people, dead broke and hungry, and they would cut one's throat for a dollar. We are just everlastingly fixed here to make money. I have heard of bonanzas, but I never dreamed we would strike one." "The groom is well known in this city and county. At one time he was the owner of the land surrounding St. Anthony Falls, having conveyed it from the government years ago. Mr. Brown would have been immensely wealthy today had he held onto his purchase, but a desire to go farther west induced him to part with it." "Nancy J. Brown has brought suit against her husband, Marsden Brown, on the ground of cruel and inhuman treatment and habitual drunkenness. Our ancestors had their ups and their downs, just like we do. Yet, I never dreamed of learning these kind of details about one of the families I've come to love so much. I began by doing a name search for Marsden Brown. Of all of the relevant results, there were only two duplicates. Had I only searched my long-time favorite, GenealogyBank, I never would have learned about Marsden's land purchase that surrounded St. Anthony Falls. This story, part of the wedding announcement to his second wife, was only found in NewspaperArchive. The announcement of Nancy's desire to divorce Marsden was only found in Newspapers.com. The letter, written by Marsden's daughter who struck it rich in the Alaska gold rush was republished in a couple of newspapers, and found only at GenealogyBank and in Chronicling America. "They will pass their honeymoon with Mr. Brown's daughter, Mrs. Fred Puhler, of Ada, this state." To summarize how I'm feeling today - YIPPEE! I love what I'm discovering about my family. And isn't it true, the more we learn about our past the more we know about who we are? I'm so glad I switched my major in college from Accounting to Genealogy. After my experience with Google and Cyndi's List this weekend, I'm ready to create the genealogist's version of the "...man shall not live by bread alone..." scripture to read "...genealogists shall not live by Google alone...". Ever since DNA proved that Griffin and John Brown ARE part of our Brown family, I've worked nearly every day to discover how exactly they fit in. I've even taken a day or two off from building our fence to find them - and that's big! the "United Methodist Archives - Central Pennsylvania Conference of the United Methodist Church". "United Methodist Archives - Western Pennsylvania Conference of the United Methodist Church"
The first link in the list was entitled "The Western PA Conference - Home". No wonder I couldn't find it before. There, they had church records, pastoral records, and statistics going back to the year 1784! And while there were no actual church records like baptisms/marriages/burials, it did have a brief history of every church in the conference and my Griffin Brown was mentioned! "A new Church was built in upper Tidioute in 1853 under the leadership of Judge Brown..."
So no "Griffin was the son of Asa and Elizabeth" statements there, but now I knew where he was living in 1853 and that he played a major role in the community. Better yet, an email address and a mailing address was listed for the local contact. Hats off to Cyndis' List for pointing me in the right direction. Afterwards, I clicked on her "Submit a New Link" button and submitted the new Western Pennsylvania Conference for her consideration. Late last night I received the email from her that my suggestion has been accepted. Right now it's found by clicking on the "Browse New Links" button in the left panel. I've heard of people coming back to life, but that was more than 2,000 years ago. Yet according to Adelaide Brown's death certificate, her husband, who had been deceased for more than two years, was listed as the informant. How could Adelaide's deceased husband be the informant on her death certificate? Below are a few ideas I had, but if you have any other ideas, please let me know in the comments. Could her husband, Charles Frederick Brown, have been alive at the time of her death? Yes, and I should follow up on this to have more convincing evidence of it. He was last known to be alive in 1910 as he was living in Philadelphia in this census. He was a lodger, working as an operator for the telegraph company, and although he was not living with his wife, he was listed as having been married for 33 years (Adelaide was living in the State Hospital for the Insane in the next county). I've also narrowed down Charles' death year to sometime before 1915 because in 1914, the book Armstrong County Pennsylvania: Her People, Past and Present, was published wherein it states that Charles was deceased. So Charles' death year was sometime between 1910-1914. I am pretty sure I have found his death certificate where he died January 2, 1911, but I'm still working on confirming I have the right one. Could the informant and husband, C. F. Brown, Sr., be a different Charles F. Brown, Sr.? Not likely. First, her surname at the time of death was still Brown. Secondly, her death certificate shows that she died in the State Hospital in Norristown, the same place where she was enumerated in the 1910 census. My guess is they did not see too many weddings in this hospital and that she did not remarry to another C. F. Brown, Sr.
What is most likely is that when Adelaide was admitted to the hospital, Charles filled out some paperwork which provided her age, birth place, and names of her parents. Not being able to get in touch with Charles when Adelaide died in 1916 (remember, Charles died before 1915), the hospital personnel probably just filled out her death certificate from the information he previously gave them, and listed him as the informant. Before today, I used to think the informant on a death certificate was always alive at the time the certificate was filled out. Now I have one more thing to be cautious about when analyzing vital records. And if I were to continue the research to conduct a reasonably exhaustive search, I would next try to locate hospital records, pursue Charles' death certificate, and even look for their obituaries.